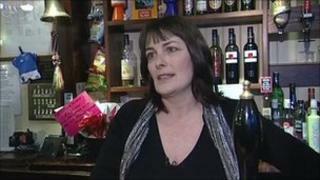 A pub landlady has won her court fight with the English Premier League over using a Greek TV decoder to show games. Karen Murphy has paid nearly £8,000 in fines and costs for using the cheaper decoder in her Portsmouth pub. But she took her case to the European Court of Justice (ECJ). It found partly in her favour, and now the High Court in London has also found in her favour. However, the Premier League said it still had the right "to prevent the unauthorised use of our copyrights". The complicated case has been closely watched as it could trigger a major shake-up in the way football TV rights are sold, and potentially pave the way to cheaper viewing of foreign broadcasts for fans of top-flight English games. Ms Murphy has spent six years fighting a prosecution for showing live football at the Red White and Blue pub without a Sky subscription. Instead of using Sky, on which it costs £700 a month to see Premier League matches, she used the Greek TV station Nova, which has the rights to screen the games in Greece, and which cost her £800 a year. The High Court in London on Friday ruled that Karen Murphy's appeal over using the decoder to bypass controls over match screening must be allowed. But a judge made clear that the other complex issues regarding the wider legality of screening matches would have to be decided "at a later date". Ms Murphy told BBC Radio Solent before the hearing that it had been a long, hard fight: "It's been very stressful, it's been a rollercoaster and to be honest now I'm absolutely fed up to the back teeth of it. "I hope at some time in the not too distant future the market will be opened up to a reasonable choice of product to buy. "As I've said before, you can have any other product and you have a choice of buying any other product, and that's the way it should be." She told the reporter she would be celebrating the win with a bottle of Sambuca. The High Court had originally sent the case to the European courts for advice on numerous points of law. The ECJ said last autumn that national laws that prohibit the import, sale or use of foreign decoder cards were contrary to the freedom to provide services. The European judges also said the Premier League could not claim copyright over Premier League matches as they could not be considered to be an author's own "intellectual creation" and, therefore, to be "works" for the purposes of EU copyright law. But it did offer some comfort for the Premier League, which receives vast sums through its exclusive broadcasting deals with Sky and ESPN. The European court said that while live matches were not protected by copyright, any surrounding media, such as any opening video sequence, the Premier League anthem, pre-recorded films showing highlights of recent Premier League matches and various graphics, were "works" protected by copyright. To use any of these extra parts associated for a broadcast, a pub would need the permission of the Premier League. This was the legal ruling that the Premier League reiterated after Friday's court judgement: "Should Mrs Murphy, or any other publican, use European Economic Area foreign satellite systems to show Premier League football on their premises without our authority and outside the scope of our authorisation, they make themselves liable for us to take action against them in both the civil and criminal courts."